First Round : Bob Tway fired a 7-under-par 65 to lead Stewart Cink by one stroke. Stuart Appleby was two back of the lead. Second Round : Justin Leonard moved to 10-under-par 134 to lead Harrison Frazar by one stroke. Tway, Cink and Vijay Singh were two strokes back of the lead. Third Round : Tway was at 12-under-par 204 and led Cink by one stroke and Leonard by two. Missed Cut: David Berganio, Jr. (74-74-MC), Jonathan Byrd (78-69-MC), David Frost (71-76-MC), Jay Hass (74-73-MC), Michael Hoey (76-71-MC), Franklin Langham (72-75-MC), Ian Leggatt (72-75-MC), Craig Parry (76-71-MC), Joey Sindelar (75-72-MC), Erik Compton (76-72-MC), Steve Flesch (73-75-MC), Jeff Julian ( 77-71-MC), Scott Laycock (75-73-MC), Chris Riley (72-76-MC), Curtis Strange (75-75-MC), Mark Calcavecchia (75-76-MC), Fred Couples (80-71-MC), J.J. Henry (75-76-MC), Per-Ulrick Johansson (73-78-MC), Brice Molder (77-74-MC), Gary Nicklaus (78-73-MC), John Daly (81-71-MC), Kaname Yokoo (77-75-MC), Greg Chalmers (83-72-MC), Roger Maltbie (84-78-MC), Jesper Parnevik (W/D). When the 2002 Memorial ended, it was Jim Furyk's name on top of the leader board. As the tournament headed toward its first tee time on Thursday though, it did not appear as if anything but the status quo was destined to rule. Tiger Woods was chasing history when he came to Muirfield Village Golf Club. His eye was trained on winning the Memorial Tournament four consecutive years, a feat that had been accomplished in a PGA Tour event by only two others, Walter Hagen and Gene Sarazen, and not since Sarazen in 1930. "That would be nice, to put myself in elite company like that," Woods said Practice-round reviews suggested that the course was as dry as it had been in quite a while, which conceivably had the hit-and-run crowd on a more even playing field with the power elite. One of the latter summarily shot down that notion, though. "The golf course is as firm as I've seen it in a couple of years," said Ernie Els, "and I'm still getting only two yards of roll on my drives." So that meant it was still going to cater to the same guys? "Same guys?" Els said. "Or same guy?" Two days earlier, Woods had won the Deutsche Bank-SAP Open in Germany - his third victory of the year - by defeating Colin Montgomery in sudden death. He was back at a course he had played like no one else the past three years, when he was a cumulative 51-under par at Muirfield Village and had prevailed by increasingly wider margins each year. And he expressed confidence that no matter how the course played this time - hard and fast or soft and long - he had the shots to tame it again. Woods then started his title defense with his worst first round score of the year, a 2-over-par 74 climaxed by a double-bogey at 18, where he three-putted from 30 feet. He finished the round nine strokes behind leader Bob Tway, the 1989 Memorial winner, whose 65 was his best score ever at Muirfield Village. Tway credited his round to improved putting, a handy asset on a day when the sun and wind abetted greens that some players swore had become quicker overnight. The field averaged nearly a stroke-and-a-half over par. Only 27 players broke par. One of them, surprisingly, was Jack Nicklaus. He had not decided until Wednesday that his back would allow him to play, but then turned in a vintage charge to a 71 with four birdies in his last five holes. It was his first sub par round in the Memorial since 1997. He went on to make the cut the next day. Justin Leonard turned in a nice opening round as well. He birdied two of the last three holes for a 69 to get into contention again on a course where he won the 1992 U.S. Amateur and was runner-up to Woods in the 2000 Memorial. "When this place gets hard and fast, the ball rolls out and you really have to place your tee shots more accurately," Leonard said. "It's fun, and, with a little wind, it makes this course really interesting." Leonard had reason to be more interested the next day. He shot a 65 to take a one-stroke lead at 10-under-par 134 and set up an open-field pairing in the third round with Harrison Frazar, his former junior golf foe and freshman roommate at the University of Texas. Frazar also shot 65 to finish alone at 135, one stroke ahead of Tway, Stewart Cink and 1997 Memorial winner Vijay Singh. Leonard and Frazar teed off an hour apart at midday and, between the two of them, had 13 birdies and an eagle. The only bogey was Frazar's at the final hole, which ended up costing him a share of the lead when Leonard, went eagle-birdie at the 15th and 16th. For the second day in a row, Woods was not a factor. He improved his score by four strokes, but nevertheless fell one stroke farther off the lead. The 70 put him at par 144, 10 shots behind Leonard. Rain fell late in the day and the forecast was for more Saturday. A softer course for everyone would make it harder for Woods to catch the 46 golfers that now stood in front of him. Singh, two shots off the lead at 136 after a 67, predicted a shootout in the final two rounds, and that's precisely what happened. Tested by gusting winds, but helped by receptive greens on Saturday, 26 of the 75 who made the cut for the final two rounds shot in the 60's, 47 broke par, and, at the end of the day, 20 golfers were bunched within six strokes of each other. Tway finished at the head of the pack, his 68 good for 12-under-par 204 and a one stroke lead over Cink, who shot 69. Leonard dropped to third with a 72 that left him two behind. Frazar fell farther with a 75. The challenging conditions prevented anyone from separating from the rest. The top five on the leader board after 36 holes - Leonard, Frazar, Cink, Singh and Tway - all had at least a share of the lead during the round, but none led by more than one stroke. By the time Woods finished his final round on Sunday, the free-for-all to determine his successor was well underway. Tway bogeyed the first two holes, Cink the next two, Leonard the third. None ever got turned around. They finished with 73, 73 and 74 respectively. David Duval, seven off the pace when play began and trying to rouse himself from a slump dating from his 2001 British Open victory, played the first 12 holes in 7-under-par. Then he birdied number 12 to take a one-shot lead over Singh, who'd taken the lead from Cink, who'd taken it away from Tway. But Duval's charge ended with bogeys at 13 and 14, and the lead was Singh and Tway's again. But then there came Frazar - forgotten but not gone - with birdies on four of the first five holes on the back nine to tie Singh at 11-under par. "After I hit my drive on 10, I saw Duval was only one back, playing in the group ahead of me," Frazar said. "So I thought, 'Well, maybe we've got a chance at this thing.'" Frazar wasn't the only one watching the board and imagining the possibilities. "I was really surprised by the time I got to the seventh green," said Furyk. "I'd made one birdie and a couple of good par saves, and now I'm looking at the board and saying, 'Wow, I'm only three back and there's a lot of golf to be played.' It kind of gets you excited." From there, Furyk channeled his emotions into results and executed two memorable shots that brought him his seventh Tour victory and the $810,000 first prize. After birdies at eight and nine pulled Furyk within a shot of the lead, he knocked in a slick, curling, 25-foot chip from behind the green at 12 to become the seventh player on the day to hold at least a share of the lead. That birdie tied him with his playing partner, Singh, along with Frazar and David Peoples at 11-under par. After Peoples, playing just behind Furyk and Singh, went to minus-12 with a birdie on 12, Furyk tied him again with a birdie at 14. Then Furyk produced the shot of the tournament, a flip from the neck-deep bunker to the right of the 15th green that banged against the flagstick and fell in the hole for an eagle 3. The eagle gave Furyk a two-stroke lead, and he expanded it to three and reached 15-under par with his sixth birdie of the day at the par-3 16th hole. He prolonged the suspense when he missed both the fairway and the green at 17 and bogeyed. But Singh could not accomplish the necessary two-shot swing when he failed to hole a 20-foot birdie chance. Finally, John Cook, playing in the next to last pairing of the day, surged to within two strokes of the lead with two holes to go, with Furyk in the clubhouse at 14-under par 274 after a par from the fairway bunker at 18. But, unable to convert a makeable birdie opportunity of 10 feet at 17, Cook finally settled for a second-place tie with Peoples at 276. Singh, who bogeyed the last hole, tied for fourth at 277 with Duval, Frazar, Tway and Japan's Shigeki Maruyama. 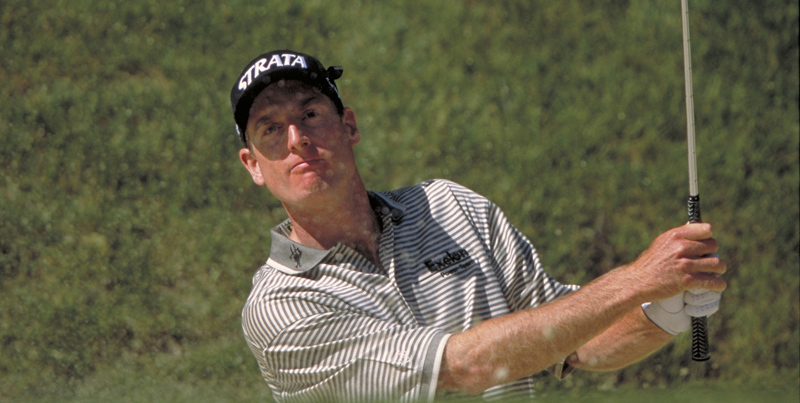 Furyk's 65 was the lowest final round by a Memorial winner, and the five strokes he made up on the last day tied the tournament record set by David Edwards in 1992. And, for the first time in four years, the Memorial had a champion who was the antithesis of the type of player who had been beating up on Muirfield Village in recent years. "I guess he doesn't do the things that people talk about superstars doing," said Furyk's caddie, Mike "Fluff" Cowan. "They hit it pretty far. Jim hits it adequately far. People tend not to talk about the guys that just gut it out, and putt good, and play the game. He plays the game very nicely."